(a modern-day) Margery Raves On: A Day in L.A. It reminded me of when we had to flee Malibu when James was 4 days old, the strangely prophetic flames chasing us down the mountain to the sea. I grabbed bathing suits, a juice box, and a change of clothing. Then I jumped in Jay and Katherine’s car to pick James up from preschool. I need to tell you about this car. Once upon a time, it belonged to my husband. He bought it when our then-High-Schoolers shamed him into trading his businessman sedan in for an SUV. I am definitely not one to point the finger at anyone else’s vehicle. At one point early in our marriage, one of my husband’s friends recommended that he purchase a dog pen on wheels for me, so he could just hose down the filth periodically. I had the exact same fender-bender 4 times in my college car. (A very cool, very fast, dark green 1970 Camaro. My mother actually cried when my indulgent father bought it for me.) Even now, my husband is hesitant to send the 50th-Birthday-Mom-Finally-Got-A Nice-Car car to the shop for fear that a fresh scrape or dent might appear the day after it was fixed. So we leave the souvenirs of past indiscretions to serve as future warnings. Bottom line: We are not car snobs. If the house and the individual are decently presentable, that’s enough. I was off in the Blue Bomb II* to get James and high-tail it to Santa Monica, where 6 miles means at least a 10 degree difference in temperature. Stopping at a major intersection, I looked to the left. There was a tiny speck of a car heading my way from a long way off. I turned a respectable right into the right lane, not screeching on two wheels, but not at a snail’s pace, either. I hear a loud, angry, insistent horn coming from the left, where the tiny speck has morphed into a black Mercedes SLR McLaren Roadster,**headed my way at about 100mph. But that’s not my problem. I am going the speed limit. Mr. Mercedes roars right into my rear end, and hugs it. When there is about 3/4th of a car space between the car in the left lane and me, he defies physics and squeezes around me and in front of me. …where he decides to forcibly apply his brakes, while brandishing a middle finger toward the sky. I have a millisecond where the dark side wins. Where I brandish back. Where the stress of the past few weeks and the abnormal hideous heat and the nasty sinus infection I’m hosting win out over every other consideration. I have a flashback of Kathy Bates in Fried Green Tomatoes: “I’m older and I have more insurance! Bwaahaahaahaa!! 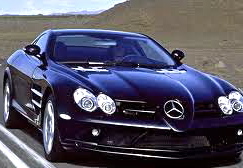 !” as I slam into the back of his beautiful, unmarred, expensive car in the battered, beat-up Blue Bomb II. But I find myself doing the opposite. I slam on the brakes instead, causing all the fragile items on the front seat to crash to the floor. The contents of my purse spill out and roll along the floorboard. As I lift my hands up toward the driver looking in his rearview mirror for my response, I find them heading to my mouth. And I start blowing him kisses. I know it’s insane. I know I’m losing it again. But then I start laughing so hard I almost cry. It drives Mr. Mercedes, glaring at me in his mirror, absolutely crazy. He exaggerates the original gesture, almost pounding his roof with his fat finger. And that makes me laugh even harder, until I do cry. I think, Darlin’, you don’t even know what trouble is. And then the action turns into emotion. I feel so sorry for him. He has no clue what the future holds, when every one of us is eventually humbled. He doesn’t realize that one day he will have much larger problems than a grandma turning in front of him when he’s in a hurry. So I let him think he wins. After the next light, he roars off to tailgate the next victim. Soberly, I catch my breath. Deep breathe to slow down the accelerated heart. Have an attitude adjustment. I think about things having to do with turning the other cheek and heaping burning coals on someone’s head. And then I go pick up my favorite little guy and head for cool waters. Does anyone else ever struggle with road rage? Do you think it is difficult to handle it in ways that reflect your world-view? Anyone have any stories to share? One of my ex boyfriends did something similar once--by sticking his tongue out at a guy and then literally turning his head the other direction (eyes only on the road), which just further enraged the guy. People are so silly/stupid/unaware. We are all in this together and getting that worked up over nothing doesn't solve anything. You were right to feel sorry for him. He has no idea. Glad you weren't in an accident and geez, I HATE it when I have to slam on my brakes and my purse goes flying!! Ugh!!! I do a LOT of driving with my job and I have encountered all kinds of drivers with what would appear to be all kinds of problems. Yesterday a woman in some sportscar-ish thing jumped in front of me so she could pass another car that was going too slow for her liking. I had to slam on brakes to keep from hitting her. (Purse emptied onto the floor along with the contents of my lunch bag.) Then, when a car tried to change lanes and get in front of her, she SPED UP to keep the car from getting in. Best part - there was a fish emblem, a sticker advertising a local church (thankfully, not mine! ), and a "Jesus is the Reason for the Season" sign right there on the car. I guess the moral of the story is that if you want to act like a jerk in traffic, be careful about what you are advertising! 106 degrees?! I am going to Anaheim the first week in November - please tell me that it will be MUCH cooler by then! What's inside a person is often revealed behind the wheel, isn't it? I've seen my share of crazy people with fish stickers, too. Oh my. A few years ago, my pastor husband was hospitalized with a nervous breakdown. I was definitely in unchartered territory. He took time off from work to heal, but being Mom I had to keep all the plates spinning for him and our three children. It was a crazy time for us, and I was exhausted, but it was my daughter's 13th birthday and I didn't want to disappoint her. (Looking back, I think I would have told her we would just have to celebrate it later.) But I was bound and determined to go shopping and pull off a party if it killed me. So I was driving through a strip mall parking lot and apparently, I wasn't driving on all my emotional cylinders! I cut off an older gentleman (I use this word with respect as he was older!) when I made a sudden left-hand turn. He hooooonnnkkkkked and yelled through his window. I threw up my hands and mouthed, "I am so sorry" as it was obviously my fault. A few seconds later we met again as we were turning around. He honked again and continued to yell through his window -- "what's wrong with you?" "learn how to drive, lady," etc. Out of nowhere I started bawling my head off, stopped my car, rolled my window down and screamed, "I TOLD YOU I WAS SOOOOO SOOORRRRY. WHAT ELSE DO YOU WANT FROM ME?!!!" The man's eyes grew as big as saucers, he put his head down, gave me a sheepish wave and drove off! It felt good. I guess it was my estrogenic rage against road rage! Okay, so my four kids and I were on our way to church on Easter morning, running a "tad" late (but not much!). I came to a traffic light where I had a right-hand turn on a red light and I looked to my left, and judged (I promise) that I had enough time to make it, prior to the other car, which was just starting up from a stopped traffic light. This car came right up on my tail, in a hurry, and continued to hug my bumper through another stopped light, until I could switch lanes, whereupon she pulled up next to me at the light. I smiled, shrugged my shoulders and put my hands palms-out, as if to say "what are ya gonna do?" She, in pink-suited Easter garb, glared at me and gave me the finger - I mean, in a big way, not subtly. I was so shocked, that I just smiled an even-bigger smile and then gave her a little wave and mouthed Happy Easter. Needless to say, all seven teenagers in the combined cars were mortified. :) Your post made me smile and immediately brought this incident to mind!! Living in LA with the traffic has brought out the worst in me; the upset of being honked at, nearly rear-ended, and flipped off multiple times is exhausting. I agree, I stopped fighting for my own sanity. Now when I accidentally cut someone off and they honk at me, I wave at them politely, as if to say, "Hi there". If they continue to honk and flip me off, I wave even bigger with my hand out the window to emphasize the wave and that I did see them. All the while smiling and mouthing, "Have a good day". The smiling and waving help ME the most. Additionally, I let ANYONE come into my lane who wants to by waving them in - it's just not worth the extra internal frustration and physiological drain. This post made me smile through the hint of tears. I love how you were able to manage your emotions in the moment (and, in doing so, ultimately were victorious over Mr. Mercedes). I think that driving brings out the worst in me. I become an impatient, rude jerk too often. But I love the perspective you give here. Life is too short and too precious to waste it on road worries.